Tag line: "The nightmare has begun"
While I admit it’s not perfect, I’m a fan of Jeff Lieberman’s Squirm, a horror flick about killer worms (that’s right, worms) attacking a small southern town. 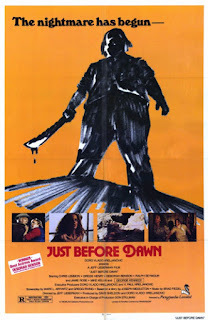 Whereas that 1976 film was his unique take on the monster movie genre, 1981’s Just Before Dawn is the writer / director’s stab (pun intended) at the slasher craze, which, thanks to Halloween and Friday the 13th, was growing in popularity at the time. Five hikers: Warren (Gregg Henry) and his girlfriend Connie (Deborah Benson); Jonathan (Chris Lemmon) and Megan (Jamie Rose); and Jonathan’s brother Daniel (Ralph Seymour) head into a remote mountainous region of Oregon to scope out the landscape (Warren holds the deed to a few dozen acres of land in this area, though he’s never been there before). Despite warnings from both the Park Ranger (George Kennedy) and a wayward hunter (Mike Kellin) who claims a “demon” killed his nephew on the mountain, the friends drive their RV deep into the woods, setting up camp next to a waterfall. Sure enough, as the quintet gets caught up in their picturesque surroundings, they fail to notice someone is lurking nearby, and before long, the peace and serenity will give way to screams of terror. With its tale of five careless friends who venture into the wilderness and come face-to-face with a machete-wielding behemoth, Just Before Dawn has a lot in common with movies like Friday the 13th and The Burning, putting this 1981 film squarely in slasher territory. But there are elements of 1972’s Deliverance here as well, which Lieberman himself cited as his inspiration for the movie (along with its inbred-style killer, the leads have a run-in with a backwoods family that’s none too happy to have them around). Whatever its influences might be, Just Before Dawn is a nifty little horror filck, with a good cast of characters, some eerie background music (provided by Brad Fiedel, who, in later years, would compose the scores for The Terminator and Terminator 2, among others), and a handful of well-executed scenes, starting with the opening sequence in which the hunter and his nephew (Charles Bartlett) are hanging out at an abandoned church, only to realize, much too late, that they are not alone (the hunter looks up through a hole in the roof and sees someone peering down at him, a shot that Lieberman frames in such a way that it’ll surely send a chill down your spine). 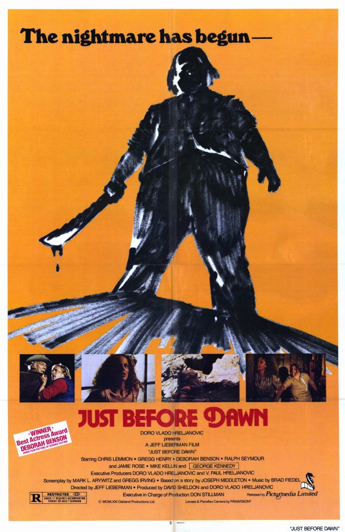 Like the “monsters” in Squirm, this 1981 film is unusual in that it favors atmosphere and suspense over blood and guts, yet while this definitely sets it apart from the era’s mainstream slasher offerings, Just Before Dawn is a movie any fan of the genre will surely enjoy. Even without the gore, Just before Dawn delivers the goods.